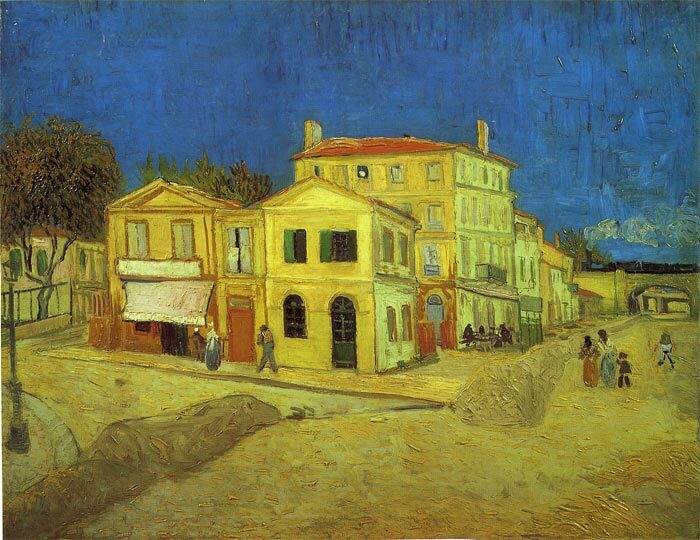 In May 1888, Van Gogh rented four rooms on the right-hand side of a house on the Place Lamartine in Arles- The Yellow House. His living quarters were the ones with the green shutters. His bedroom lay beyond. Van Gogh had finally found a place where he could not only paint but also welcome his friends. His goal was to establish a “Studio of the South,” where he and like-minded artists could work together. The view is also an exploration of color contrast: “What a powerful sight, those yellow houses in the sun and then the unforgettable clarity of the blue [sky],” he wrote to Theo in the letter that accompanied a drawing he had made after the painting of The Yellow House. SPECIAL NOTE : The painter will make the reproduction as close to the original oil painting as possible. If you want your painting to alter from this likeness, please email us and " The Yellow House , 1888 " will be reproduced according to your special requirements.